Get the Versatility of a Diamond Engraver with the Convenience of a Hand Scribe Whether signing your work or creating an engraved masterpiece, this tool is perfect for you Featuring a light weight handle with an adjustable chuck and three diamond coated tips, the glass engraving diamond scribe is not only comfortable but easy to use. 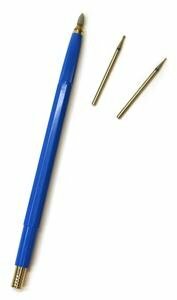 Simply place your pattern under your glass and start engraving Includes scribe handle, small ball point tip, large ball point tip, and broad shading tip. Project shown by artist Cere Seddon. Get the versatility of an engraver with the convenience of a hand scribe!